A new report by the US-based National Security Network confirms the F-35 stealth fighter is no match for Russia’s Su-27 series aircraft or even the much older MiG-29. America’s F-35 Lightning II stealth fighter may end up becoming cannon fodder for Russian Sukhois, suggests an August 2015 report by the US-based National Security Network (NSN). In ‘Thunder without Lightning: The High Costs and Limited Benefits of the F-35 Program’, the think tank’s policy analyst Bill French and researcher Daniel Edgren say the F-35 is likely to be “outmaneuvered” and “outgunned” by its “near peers” such as the Russian Su-27 series Flanker fighter jets. The Indian military summed it up beautifully after an air combat exercise with English air force pilots in Waddington in 2007: According to India’s Ministry of Defence, because there are plenty of counter and counter-counter measures available to make “modern missiles with claims of inescapable parameters redundant by using ‘chaff’ and other active/passive measures, a ‘gun kill’ is invariably a most certain kill”. Western pilots who do not hone their close combat skills are in for a nasty surprise if they face a capable air force such as those of Russia, India or China. The F-35 is a large aircraft but most of its internal space is taken up for fuel. This is a double whammy for the Lightning. First up, there’s precious little internal space for carrying bombs and missiles. Secondly, if the missiles are carried on external hard points, it nullifies whatever little claimed stealth it has. “In addition to lacking maneuverability, the F-35 is hampered by limited space for storing weapons in its internal bays. A deficient weapons capacity has significant consequences for the aircraft’s ability to conduct missions against air and surface targets. In air-to-air engagements, the F-35 will be outgunned by foreign fighters that can carry greater numbers of missiles and cannon rounds. On the other hand, Russian Flankers have 10 external hard points to carry air-to-air missiles or other ordinance. Some like the Su-35 Super Flanker have 12 external hard points. This is a huge advantage for Flanker pilots because they can fire repeated salvos to achieve an air-to-air kill. Compared with the armoury of short-, medium- and long-range missiles that Flankers are known to carry, the F-35 has been virtually disarmed. French and Edgren quote Major Richard Koch, chief of the US Air Force Air Combat Command advanced air dominance branch, “I wake up in a cold sweat at the thought of the F-35 going in with only two air-dominance weapons.” But the aircraft is still sizeably outgunned even when carrying the maximum four missiles. The above circumstances should not be expected to characterize BVR engagements between the US and an advanced adversary. "For example, the presence of electronic countermeasures alone would probably result in a drastically lower probability of kill as Russian and Chinese fighter aircraft presently employ electronic countermeasures that use digital radio frequency memory (DRFM) jamming reported to significantly hinder radar-guided missile effectiveness. DRFM jammers in Russian and Chinese aircraft are reported to “effectively memorise an incoming radar signal and repeat it back to the sender, seriously (hampering) the performance of friendly radars. Worse, these new jammers essentially blind the small radars found onboard air-to-air missiles like the Raytheon AIM-120 AMRAAM, which is the primary long-range weapon for all US and most allied fighter planes”. 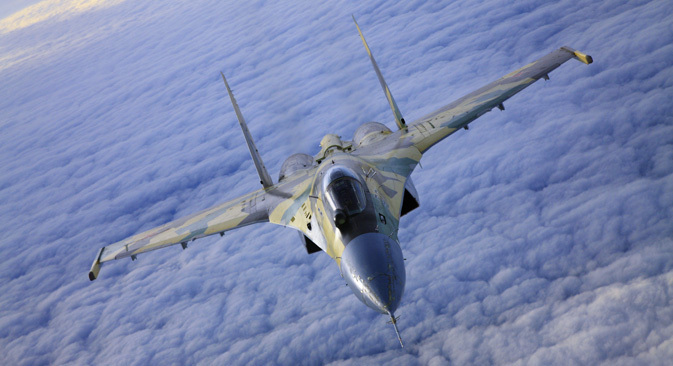 Sukhois fly in to save the day but for how long? The report concludes: “Despite plans for the F-35 to replace most of America’s fighter and attack aircraft, the platform is ill-suited to cost-effectively counter near-peer foreign militaries. The aircraft lacks the maneuverability, payload, likely ability to generate sorties, and range to effectively compete with near-peer competitors despite its lifetime costs of $1.4 trillion. The think tank’s findings portend grave implications for American security. “By staying fully committed to the F-35 programme, the United States is investing unprecedented resources in the wrong aircraft, at the wrong time, for the wrong reasons,” it says. If the US still proceeds with full scale production, slated for 2019, the F-35 could turn out to be the biggest dud in military history, putting at risk American, and allied, lives in danger.